Before I begin, I feel I should disclosure that I am a man and a highly satisfied one. As a man, I adore women and that feeling extends beyond the sexual desire or need for female maternal attention. I believe that women are the true representative specimen of our species whilst men are nothing but a necessary satellite specimen that exists solemnly for one purpose — that of providing stronger disease resistance to future generations by means of genetic variability. By now, most men will have their ego boiling up in rage and stop reading. Nonetheless, if you do continue, I will provide the sufficient arguments and scientific evidence on which I'm supporting such claim. Let us start with the basics. The human genome consists of 23 pairs of chromosomes. Your father contributes 23 chromosomes and your mother contributes the other 23, making a total of 46 chromosomes inside almost every cell in your body. This combination is crucial to provide genetic variability. Since they always come in pairs, there is room for some redundancy. Should one of the chromosomes be defective, the other one takes control and you have thus avoided disease. Even if you are not afflicted, thought, you carry the disease with you and might transmit it to your children unless you find a partner that can provide a non-defective chromosome. 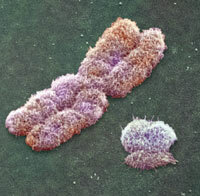 This happens for every chromosome except the X and Y ones. Women are women because their 23th pair contains two X chromosomes whilst men are men because their 23th pair contains only one X chromosome and a tiny Y chromosome, as you can see in figure 1. This last one is responsible for the fetus differentiation into a male. Since X and Y are so different, even though they do share some genes, there is almost no room for redundancies. This means that men better receive the best X chromosome they can, because, if not, there is a high chance the Y chromosome doesn't have the information needed to cover for the malfunctioning one. Haemophilia is a very good example of such a situation. In sum, women have richer and more resilient genetics. The X chromosome represents about 5% of a human cell's genetic information in contrast with the less than 2% the Y chromosome represents. Not only that, but Yamauchi, Y., Riel, J. M., Stoytcheva, Z. & Ward, M. A. presented their findings in a 2013 Science article with a self-explanatory title Two Y Genes Can Replace the Entire Y Chromosome for Assisted Reproduction in the Mouse. At least, for mice, the Y chromosome is rendered almost useless. The results cannot be directly extrapolated for other species such as us humans, but it is an amazing result nonetheless. Another interesting finding is that it seems women have contributed more to the human DNA pool than men and this is very counterintuitive. One ought to believe that since each parent contributes half, then both male and female contribute on an equal ratio, but Lippold, S., Xu, H., Ko, A., Li, M., Renaud, G., Butthof, A., Schroeder, R. & Stoneking, M. seem to disagree. In a 2014 article published on Investigative Genetics entitled Human paternal and maternal demographic histories: insights from high-resolution Y chromosome and mtDNA sequences they present their results and provide some possible explanations for this. Let us think for a moment on scarcity of resources. What's more valuable? Gold, diamonds, oil, sand or water? The first three are much rarer that the last two and thus are more valuable due to the greater amount of effort needed to get them. That effort includes the time spent just searching for gold, diamonds or oil and then the whole logistics of getting them from wherever they are. Every organism that reproduces asexually is female. Now focus on us humans as a sexually reproductive species. There are two genders and each has its own features regarding sexuality and reproductive capability. Ignoring the fact that women are born with a huge, but mostly limited (between 1 and 2 million), number of eggs, these simply mature one — or two, rarely — at a time on a monthly basis. Men, on the other hand, can produce something like 1 500 sperm cells each second, according to Robert E. Braun in a paper entitled Every sperm is sacred—or is it? published in Nature Genetics 18, 202 - 204 (1998). I believe it's time for some mathematics. Alice and Bob were born on the same day and reached sexual maturity at the same time — let's say on their 13th birthday. They will fall in love and marry and die on the same day — their 57th birthday. Assuming that neither menopause or andropause are reached, Alice and Bob were fertile for 44 years. I'm also assuming a constant gamete production rate for each of them — one egg per month for Alice and 1 500 sperm cells per second for Bob. That means Alice produced one egg each 2 592 000 seconds. But by that time, Bob had already produced a total of 3 888 000 000 sperm cells. If Alice never got pregnant and produced exactly one egg every month, after 44 years she produced a total of 528 eggs. Bob, on the other hand, produced an astonishing 2 052 864 000 000 sperm cells. To put that in perspective and get you some feeling of how big a number that is, it's about 7 times the number of stars in the Milky Way. My point is eggs are a scarce resource and, for that reason, women are very precious — as compared to men. Females are usually the limiting resource to reproduction in a species, because males often have a near to limitless supply of gametes. One man could fertilize all the women in the world and this fact gives women the ability to be picky when choosing a partner, because males will compete for their very rare eggs. Such competition will make some men more successful than the rest and thus create a greater reproductive variability. This idea is called Bateman's principle and is the reason why men are nothing but a satellite gender — they exist purely to provide genetic variability. How successful can one man really be? Well... According to the article Chiara Batini et al. published on Nature Communications 6 entitled Large-scale recent expansion of European patrilineages shown by population resequencing, more than 60% of modern Europeans are the descents of just three men. There is much more I would like to write about, but I feel this article has become long enough. If you're a man, make sure you treasure the women that are close to you — they truly are diamonds among us.